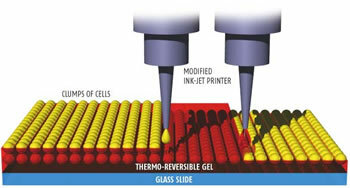 Ink-jet printing has come a long way; we used to use it for what was called "hard copy." Soon, you will be able to use a modified ink-jet printer to make yourself some breakfast. Tissue engineers like Vladimir Mironov of the Medical University of South Carolina, and Thomas Boland of Clemson University, have been printing biomaterials with modified ink-jet printers. The cartridges are washed out and refilled with suspensions of living cells; the software that controls the characteristics of the ink is reprogrammed and you're good to go. Boland and Mironov use layers of "thermo-reversable" gel to build up three-dimensional structures like tubes - capillaries, to use the medical term. When the tiny droplets, or clumps, of cells came together closely, they fused; the gel can be easily removed, leaving a tube of tissue. Just as printers contain inks of different colors, so tissue printers could contain different cell types to create complex structures. Now, it seems to me that a tube or complex living organ is a pretty complicated structure. 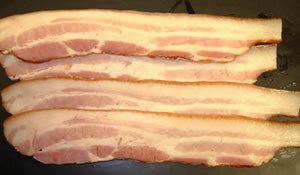 Why not practice with a simpler, more two-dimensional form of muscle tissue - like bacon, for instance? Nothing like fresh bacon. Take a look at Cultured Meat Straight From The Vat for yet another promising technology. See also Replacement organs hot off the press.